DPR Construction (http://www.dpr.com), one of the nation’s top commercial builders in the healthcare industry, officially broke ground this week on the new Alta Bates Summit Medical Center Patient Care Pavilion for Sutter Health in Oakland, Calif. The 230,000-square-foot Patient Care Pavilion will house 238 medical/surgical and acute rehabilitation beds when completed in early 2014. 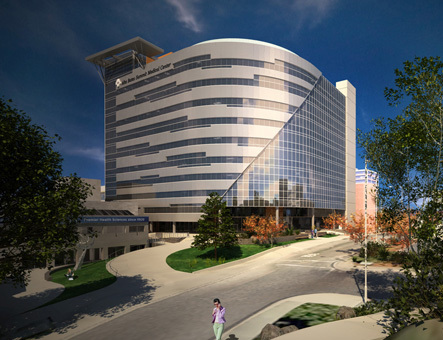 Located at 350 Hawthorne Ave., the new building consists of an 11-story patient care tower and rooftop central utility plant – all being built on a 1.5-acre site in the middle of the urban hospital campus. The pavilion will rise to approximately 184 feet above ground, with two stories built below ground, and cost approximately $244 million. The new facility will be attached to existing hospital buildings, which will remain fully operational throughout the project, on three sides and seven different floors. The entire project, with a total cost of $350 million,also includes a new Emergency Department, a 1,000-space parking structure and additional green space. The project is being delivered using a 12-party Integrated Form of Agreement (IFOA) in which the owner, architect, general contractor and key design consultants and trade partners are all co-signatories of the IFOA contract, forming the core integrated project delivery (IPD) and sharing project risks and rewards. In addition to DPR as the general contractor, the team includes Sutter Health, architect Devenney Group Ltd. of Phoenix, Ariz., and nine other design engineers and contractors. According to Peter Lockett, project engineer for DPR, the team is making extensive use of Lean Construction methodologies such as Target Value Design (TVD), a practice in which cost and constructability inform the overall design process, and Last Planner®, a system that includes pull-planning and scheduling and creating a network of commitments. The IPD team also has engaged in a high level of Virtual Design and Construction (VDC) and Building Information Modeling (BIM) to help identify and solve building challenges virtually in advance of actual construction. For example, DPR, along with structural engineer Degenkolb Engineers of Oakland and steel and rebar contractors, modeled and coordinated the tower’s superstructure and exterior skin. In addition, as part of its pre-construction services, DPR used laser scanning for the existing site and compared the scan to the model. The Patient Care Pavilion will be built in compliance with California’s newest earthquake safety law, SB 1953, and will use the California Office of Statewide Health Planning and Development’s (OSHPD) phased plan review system to accelerate the permitting process. The project is also pursuing LEED certification and meets all requirements of the Green Guide for Health Care and Sustainability Practices, the healthcare sector’s program for sustainable design, construction and operations modeled after the U.S. Green Building Council’s LEED program. According to DPR Project Manager Jay Widdifield, at the height of construction, approximately 270 people will be working on the new hospital expansion over the next three years. DPR is also building the $320 million Sutter Medical Center Castro Valley in nearby Castro Valley, Calif., which broke ground in July 2009 and is scheduled for completion in January 2013.